First, we had people who believe that J. R. R. Tolkien's Lord of the Rings is actual history. Next, we had people who think that H. P. Lovecraft's pantheon of elder gods is real. 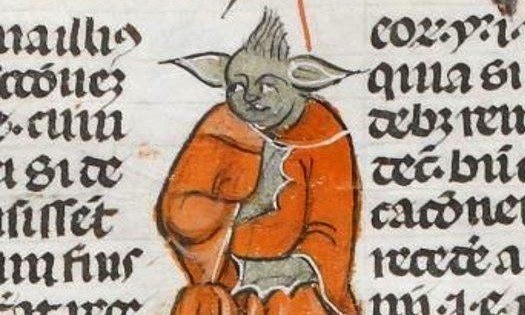 Now we have people believing that people time-traveled backwards (or forwards; sources differ on that point) from the Galaxy Far Far Away, all for the purposes of including Master Yoda in a medieval manuscript. First the facts, okay? There's a 14th century manuscript called the Smithfield Decretals, which are some of the expositions of Pope Gregory IX on points of canon law, written in France and then brought to England and illuminated. It currently resides in the British Library, and its graceful calligraphy and odd illustrations are what prompted a use of one of the images from it in a newspaper interview with Julian Harrison, the Library's curator of pre-1600 manuscripts. Interestingly, Harrison has quite a following; his blog, Medieval Manuscripts, gets an average of 36,000 hits a day, and his Twitter feed has over 24,000 followers. Who knew the Medieval Period had so many fans? Other than the fact that his expression is not so much "wise Jedi master" as it is "derpy and confused," I think we can agree that this is quite a match, yes? The Force is real. I've felt it and am still learning how to control. With a powerful Master you can transcend time and space. Because of Quantum Mechanics and the Many Worlds Theory scientists now believe that everything is possible somewhere. So why is it crazy to say there's a universe where Yoda exists. And if that universe intersects with us, that could explain this. Art imitates life. George Lucas didn't make up everything. These monks who drew this had to have a model right? This is too close to be a coincidence. The Jedi religion has more morals than the Christians. Master Yoda is somebody I would follow not a priest. Maybe him appearing here will show people were on the Dark Side. Look at the world and you have to agree. Mocking something doesn't make it not true. Their is no reason this couldn't really be Yoda. Just because something is wierd it doesn't mean that you can just pretend it doesn't happen. Yes, of course! Wierd real Yodas! Intersecting universes and the Force because of quantum mechanics! Ha ha! Please tell me you people don't know where I live! And learn some critical thinking skills, they should. Anyhow. I'm always amazed at how little it takes to set these people off. And, of course, given that the trailer for the next installment of the Star Wars saga was just released, and has been inducing multiple orgasms in the crowd who (1) wanted to become a tie-fighter pilot, (2) dreamed about owning a light saber, (3) had the hots for Luke and/or Leia, and (4) went into a prolonged period of mourning when Obi-Wan died, I suppose it's not going to die down any time soon. And honestly, I have to admit that I'd take Yoda over Sauron and the Elder Gods, if I had the choice.